Merseyrail has launched an interactive digital tourism platform to make it easier for customers to plan and arrange their days and nights out by train. 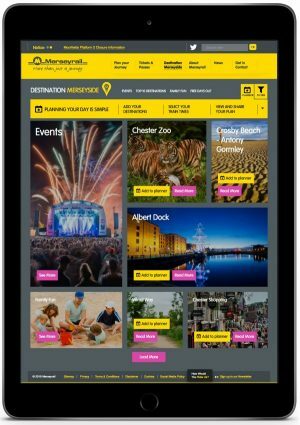 Destination Merseyside creates personalised itineraries for outings to top leisure attractions and events across the Merseyrail network, from music festivals to free events for families. Created by Liverpool digital agency Mando, the fully responsive platform allows passengers to search local events and destinations, download maps and guides as well as plan their train journeys. It allows users to create an itinerary, or personal day planner, which can be downloaded or shared with friends and family via social media or email. Categories for selection include ‘Free Days Out’, ‘Rainy Day Inspiration’ and ‘Foodie Heaven’ depending on their interests. Simon Olorenshaw, Merseyrail’s customer service director, said: “Destination Merseyside was created to provide an online showcase of fantastic destinations and events around the Merseyrail network, enabling our passengers to see quickly what the city region has to offer from a leisure perspective. One of the aims of the project is to target a younger market following a recent survey revealing that 48% of Merseyrail passengers are under the age of 34 with 28% aged between 16-25. Merseyrail selected Mando, which also created its main corporate website, following a competitive pitch earlier this year. Steven Swann, creative director at Mando, said: “This is a great example of an innovative solution that has been formed out of our long-term partnership with Merseyrail. “We wanted the site to be very visual, with simple UX, as showing the venues and emotive imagery would then help sell the various events and activities that are going on over the year.